In order to bring you the best Nintendo coverage we possibly can here at NintendoLife, we sometimes have to bite the bullet, pull up our socks and make some painful sacrifices. 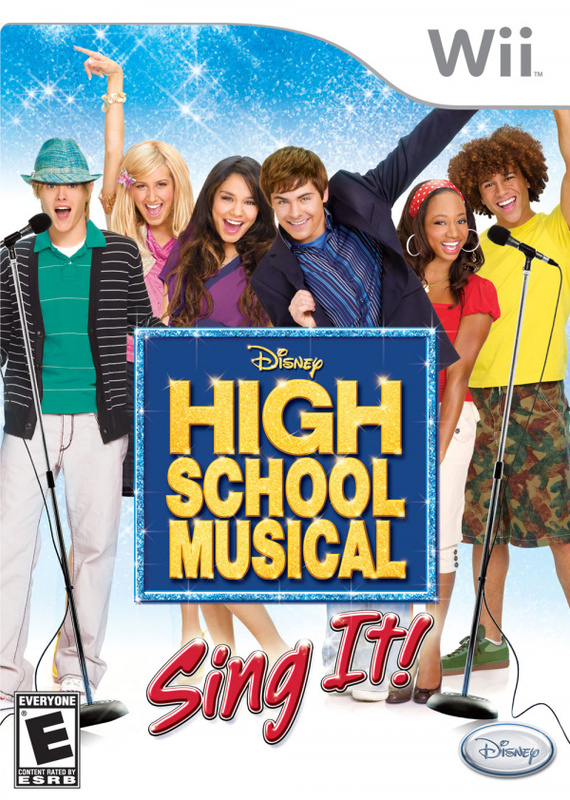 Reviewing Disney’s High School Musical: Sign It! (HSM from hereon in) is one such sacrifice. Reviewing a game of this astonishingly lamentable standard requires reserves of patience, plenty of resilience and (possibly most important of all) balls of solid steel. Sometimes it’s best to follow your gut instinct when it comes to videogames. While people constantly tell you not to judge a book by its cover and to let go of harmful prejudices, these things serve you well when it comes to games like HSM. To put it bluntly, this is a terrible piece of programming that even fans of the movies will be offended by. But before we steam in with the lengthy list of negatives, let’s consider the good things about HSM. Firstly, it doesn’t look completely terrible. The cartoony visuals are appealing and colourful, with each character bearing more than a passing resemblance to their real life counterpart – which is a good thing, obviously. Every song from the two hit movies is included as well as some other Disney tunes (this could obviously be seen as a negative point but let’s assume for the moment that you’re a fan of these fine pieces of cinematic history, and all things Disney). Ok, now onto the less appealing aspects of the game. Take a deep breath people, because this is going to be painful. Firstly, although the game boasts an impressive track listing, none of the songs are the original recordings. For reasons only known by Disney, each song has been re-recorded with different vocal artists. How do I know this fact when I’m clearly not a massive fan of the films, you may ask? Well, although I do my best to try and escape the HSM phenomena, my young daughter is totally hooked on it and forces me to not only watch the films endlessly and listen to both soundtracks when we’re in the car, but also regales me endlessly with different facts about the HSM cast. So, rather unwittingly, I’m something of an expert on the subject. It may not seem like a major problem but the fact that the songs don’t sound as good as they do in the movies renders this product a little pointless; the whole idea is that you sing along to your favourite HSM tunes, but my daughter picked up on the different vocals instantly and her enjoyment was visibly reduced. Even to the untrained ear it’s obvious that these new versions are nowhere near as likeable as the originals, lacking the punch and slick production of their movie counterparts. Why Disney decided to re-record the tunes remains a mystery; we can only assume some kind of asinine licensing issue has prevented them from utilizing the original tracks. It doesn’t end there though; more problems appear as you get further into the game. The menu system is unforgivably sloppy and badly thought out, leading to much in the way of frustration. It’s not always obvious which part of the screen selects a particular option, and you’ll often find yourself randomly clicking areas with the Wiimote pointer in the vain hope that you’ll activate the choice you’re after. Elsewhere there’s a distinctly amateurish feel; for example, when you pick a song with a male and female vocal, it often assigns the female voice to the male on-screen character (and vice versa). Not only does this destroy the already flimsy authenticity, it looks laughable in action. Plus, the characters have extremely limited dance movements and their wooden actions often make it look like they’re jiving to a completely different song. It really wouldn’t have been the hardest thing to factor in the chorography of the movies into the game, but Disney obviously couldn’t be bothered. 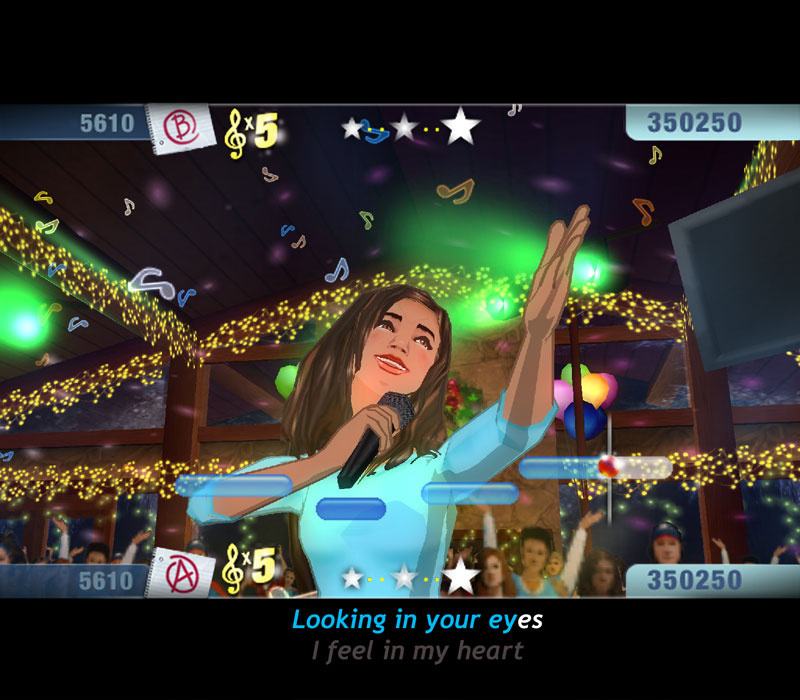 The core gameplay itself is a direct lift from Sony’s successful SignStar series, where you have to sing the tune correctly to progress. 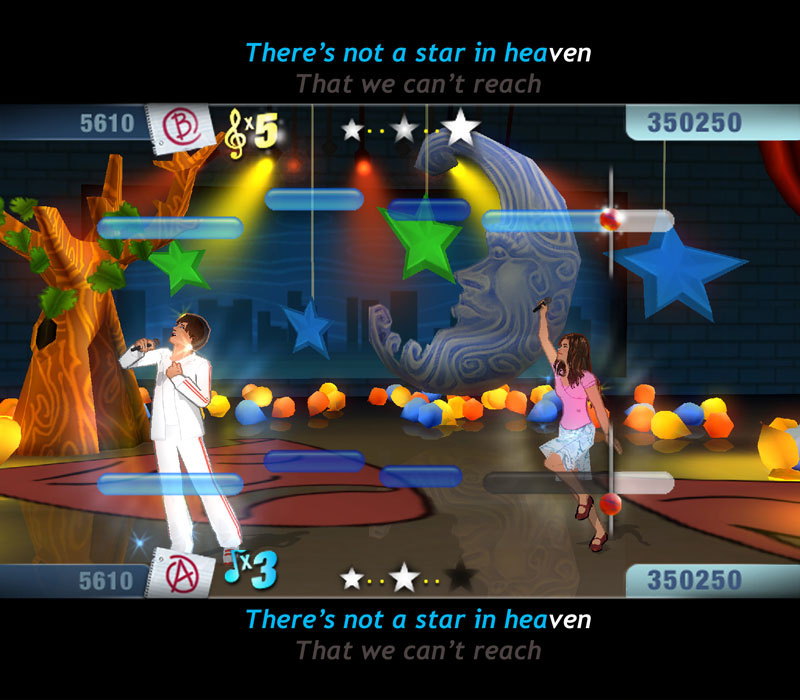 As with other karaoke games, knowing the words isn’t actually important (although they naturally appear on screen as the song plays out) – you can merely hum the tune and still score big points. Obviously the appeal of this kind of game is intrinsically linked to the music contained within, and as we’ve already mentioned, what is on offer here is distinctly disappointing. Successful progression unlocks new outfits, levels and songs, but to be entirely honest even the most diehard of HSM fans will have trouble building up the enthusiasm to access everything. 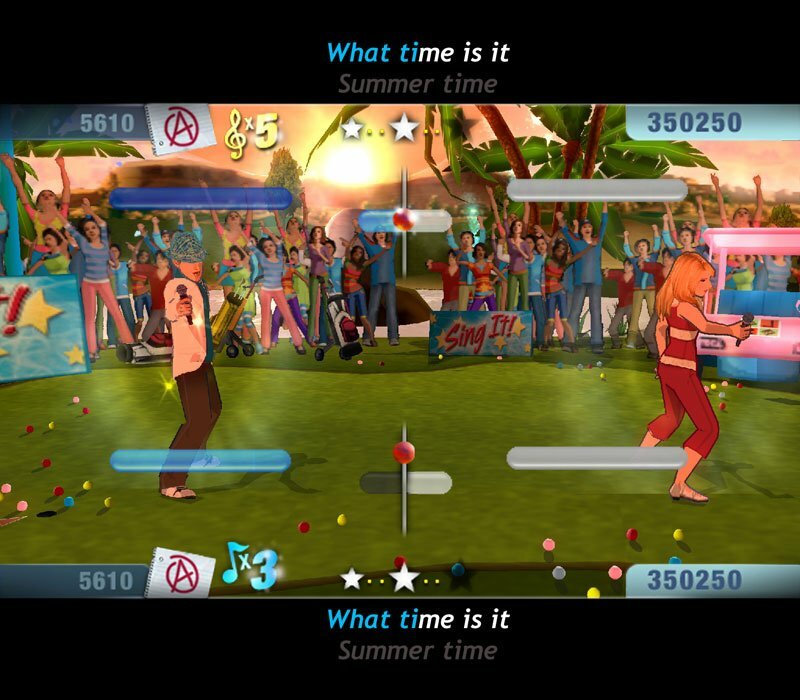 The game is so limited and poorly constructed it’s hard to imagine anyone playing it for a prolonged length of time; needless to say there are much better examples of sing-along games on the market right now; even the much-maligned Boogie offers more entertainment. We probably shouldn’t be surprised by the fact that HSM is a horrifyingly poor cash-in conveniently released in time for the both Christmas rush and the UK DVD release of the second movie. You wouldn’t believe how hard it was for me to source a copy for my daughter (thanks largely to the Wii-mania that seems to be sweeping the land) and the fact that she got bored after about fifteen minutes of play speaks volumes. If you really feel the desire to sing along to the exploits of Troy and Gabriella, you’re better off investing in the CD soundtracks and pretending your hairbrush is a microphone. You’re likely to get more enjoyment that way. That's my order cancelled then! Sorry I had to disappoint you mate, I know you were looking forward to this! They'd better not screw up 'Bratz The Movie' on the Wii. When do you review that? As soon as you give me my copy back! Thanks for the review. My 10 year old daughter is a HSM nut (hardly a shocking statement huh?). I'll be sure to give this game a pass. High School Musical, Sing It!